From A to B is a site specific installation created by artist Myranda Bair for the Central Library Food for Thought Café. The installation consists of 13 dioramas housed in the card catalog wall of the Café, and a window display of jars of honey. 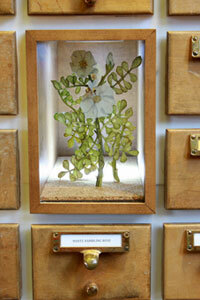 The dioramas depict native Tennessee flowering plants and beehives and are constructed of watercolor on paper cutouts, with brass wire and cork. Bair’s inspiration for flora was drawn from the botany books and papers of Augustin Gattinger, which she found in the Vanderbilt Special Collections. With this installation, Bair forms a correlation between the complex yet highly organized role the bee plays in pollination with the organizational quality of the library’s card catalog. Along side the card catalog, Bair has a window display with jars of local honey she collected from the region. 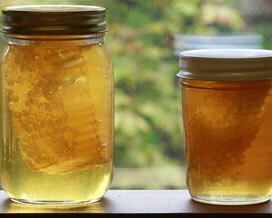 The different honey colors, qualities, and containers tell the story of the pollen’s long journey from flower to table. Bair works in many media including watercolor on paper, mixed media, found objects, food, and photography. In all her work, Bair hopes to present the viewer with a whimsical insight to the world around them. She has shown in museums and galleries across North America and Italy. She holds a BFA from the University of Texas at Austin and an MFA from the Maryland Institute College of Art. Currently, she works as an artist and illustrator based out of Las Vegas, Nevada. Special thanks to Mel Ziegler, Craig Berman, Celia Walker and others who helped make this exhibition possible. From A to B is on display in the Food for Thought Café located on the 4th floor in Central Library. Components of this exhibition may also be viewed online. Fight for Freedom highlights stories from noted journalists and others who put their lives on the line for freedom.